The addition of the Skyactiv-D diesel engine option for the Signature trim of the 2019 CX-5 gives consumers even more choices for the already well-rounded crossover SUV. Small or large—or somewhere in between—all Mazdas tested by the Insurance Institute for Highway Safety earn the organization’s highest safety scores. From smartphones to tablets, bottles and more, Mazda designers have optimized every part of the current generation CX-5’s interior to help store your belongings as conveniently as possible. The 2019 Mazda CX-5 compact crossover SUV and MX-5 Miata sports car earned top honors in the New York Daily News’ 2018 Daily News Autos (DNA) Awards, as chosen by its editors. This adds to a multitude of accolades earned by Mazda’s compact crossover SUV, complementing its record sales pace. By integrating 27 different sensor inputs more than 200 times per second, the i-Activ AWD system recognizes pre-slip conditions. When the engineers started working on the 2017 Mazda CX-5, they had some specific goals in mind, namely ride quality and refinement to match, providing a truly premium experience at a very attainable price point. Available on the 2018 Mazda CX-5 and 2018 Mazda6, Mazda is the only automaker to offer cylinder-deactivation technology on a four-cylinder engine in North America. Takashi Okamura, Color & Trim Design Group Manager at Mazda’s Production Design Studio in Hiroshima, tells us the secrets of making your car feel every inch a Mazda. Mazda has long been known for its challenger spirit and the drive to challenge the world’s largest automakers by creating better vehicles. The net effect of the CX-5’s clever i-Activ AWD is that, like the rest of the vehicle, it helps the CX-5 punch far above its weight. Mazda partnered with nonprofit foster care organization Together We Rise and the mountain bike series Over the Hump to put smiles on the faces of some Southern California-based foster youth by donating 120 bicycles. Wards rigorously evaluates every automotive brand sold in the U.S. Its independence and integrity have made it a respected arbiter of quality, and achieving a “10 Best UX” award is a major recognition for the 2017 CX-5. 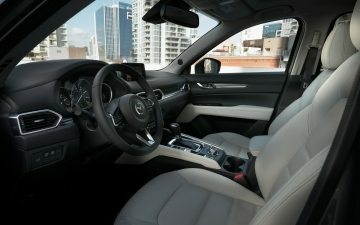 When Mazda designed the CX-5 crossover SUV, the goal was to create a crafted interior with a sharp focus on how the driver and passengers perceive comforts and create a unique connection with the vehicle. While affordable, reliable, great-driving cars might keep the Hostetters coming back for more, it’s quality care and attention from the Randy Hiley dealership that’s the cornerstone of their longstanding relationship with Mazda. Once you escape the urban L.A. sprawl, there are scores of canyon roads swooping up into the hills that can put a huge smile on an enthusiastic driver’s face. With the help of the Mazda CX-5, we meet three Californians who are challenging the status quo, and pushing the boundaries in urban sports.